Located at 324 North Broadway, this one and a half story Victorian house, was built in the town of Red Lodge by G.L. Finley around 1907. Arriving in Red Lodge in 1902, General Finley served as an alderman to the city government, a county clerk and recorder and worked for the railroad for several years. Wife and poet, Mayme Finley, came west by covered wagon at the age of two and moved to Red Lodge with her husband. Her poetry appeared in several magazines and a framed copy of her poem, “Bitter Root” can be found in Historical Library in Helena. The Red House in now part of the Red Lodge Clay Center and is used to house our guest artist who participate in the Artist Invite Artist series. 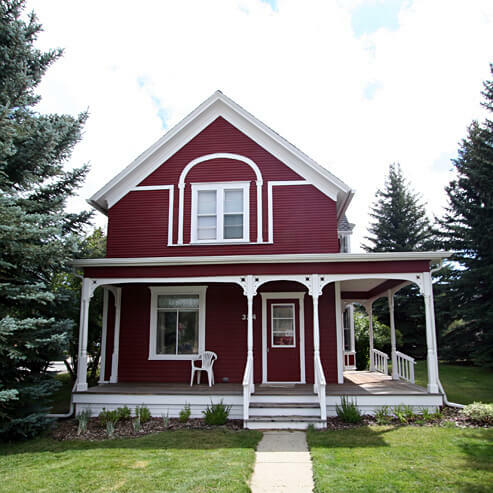 This two story Red and White Victorian in approximately 1900 square feet and has 5 bedrooms. There is a garage and off street parking. The house is fully furnished and is located on the main street of downtown Red Lodge. It is one block from the grocery store, across the street from the library, and walking distance to many shops and restaurants…a great location for enjoying Red Lodge.